It was 0330am and I had muskelkarter. That'd be Muscle hangover in English but it explains why I couldn't sleep and why I'd been tossing and turning for the previous two hours. The reason? I had just put my body through the Engadin ski marathon. 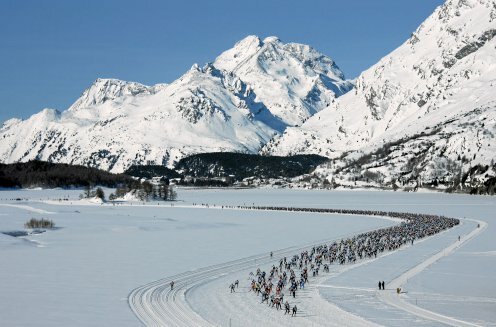 A cross-country ski race (42km) through the heart of Switzerland's stunning Graubunden region, from Maloja, past St Moritz, Pontresina and finishing in S-chanf. This is Switzerland's biggest cross-country ski race and part of the Worldloppet series. And once you strip off the chic exterior, St Moritz and the surrounding area is a cross-country mecca. We arrived in town in jeans and fleeces on Friday evening, feeling a little out-of-place compared to everyone in their tight Lycra who all looked like they all belonged on the Swiss cross-country ski team, or at least the masters version. The problem with cross-country skiing is that the UK isn't exactly geared up for it. So my training had consisted of two roller ski sessions in the rain in Manchester plus an hour and a half on the snow the day before the race when most people are resting. Not exactly ideal. So come race day on Sunday I was nervous. Very nervous. I fuelled up with some bircher muesli, bread and cereal and caught the bus to the start at Maloja. The skies were clear, the sun was out and we had our skis on ready to tackle 42km ahead if us. The scariest part, aside from actually entering in the first place and standing at the start lane, was "Mattress Hill." If I say it's the only part of the course you're allowed to take your skis off to tackle, you get the idea. Picture a blue ski run, fairly steep, trees everywhere and think slushy, heavy snow. Now stick on some very narrow cross-country skis, and try going down a mangled up run that 10,000 people have already been over. Not fun for the skiers. Hilarious for the crowds. By half way I felt good. A few kilometres later I didn't . And the last ten 10km took every ounce of energy out of me to get up the hills, which by that point felt like mountains. Some kind person could clearly see me struggling and thrust some much-needed chocolate into my hands and another cup of luke warm energy drink which tasted more like Lemsip. I eventually crossed the line in 4'42...a good three hours after the winner. But with a huge sense of pride and a big smile. Yes it was tough and at some points I wanted to stop and cry. But of course, once you've drowned your pain in fondue, beer and grappe, a magic airbrush sweeps across your body and mind, taking away any thoughts of aches and pains and you start t0 plan the next one.